GREENVILLE, S.C., Dec. 12, 2013 - Michelin today held an event to mark the opening of its newest manufacturing facility in South Carolina. Michelin executives and employees were joined by dozens of dignitaries from across the state to celebrate the milestone just 17 months after breaking ground on the Anderson County facility, which will produce large tires for earthmoving equipment. The project completion is the fastest greenfield construction in Michelin's history and enables the company to begin production of commercially available tires in January 2014 for sale in mid-2014. Michelin, South Carolina's largest manufacturing employer, announced a $750 million investment in April 2012 to construct the 800,000 square foot facility and expand its existing Earthmover manufacturing plant in Lexington, S.C. Both projects have created hundreds of jobs and expect an additional several hundred in future years. "Michelin continues to make investments in multiple countries around the world that will position our company for long-term growth," said Pete Selleck, Michelin North America chairman and president. "It's a source of pride to know that what we're doing right here in South Carolina plays such an important role in our company's global business strategy. It's a testament to the business-friendly climate in the state and the dedicated, productive and skilled workforce that serves as the engine behind our success." The new facility, known as US10, is Michelin's 19thplant in North America and ninth in the state of South Carolina. It will produce large Earthmover tires – which can stand up to 13 feet tall and weigh up to 5.5 tons – for more than 1,300 mining operations around the world. Eighty percent of the tires manufactured at this facility will be exported, most of it through the Port of Charleston. "That we have constructed this state of the art facility in 17 months is nothing short of remarkable," said Bruce Brackett, senior vice president, Michelin Earthmover & Industrial Tires Worldwide. "These tires are no ordinary ones, and they cannot be built just anywhere by just anyone. The fact is, the Michelin Earthmover tire is a highly sophisticated product to develop and build, and today South Carolina is the leader for the vast Michelin Group." Since 1975, Michelin has invested more than $5 billion in the state of South Carolina. The company has announced investments of $1.15 billion in the past two years alone. Currently, more than 8,000 of Michelin North America's 22,000 employees are based in the state. "Today is another example of Michelin's 40-year commitment to the state of South Carolina," said South Carolina Gov. Nikki Haley. "With billions invested in our state, the creation of thousands of jobs and countless community-focused activities that have enriched the lives of South Carolinians, Michelin has set a high standard for manufacturing in our state." "The opening of this new Michelin plant once again shows South Carolina remains a global player when it comes to manufacturing," said U.S. Sen. Lindsey Graham. "But it also underscores the critical importance to our state's economy of deepening Charleston Harbor as 80 percent of the products made here will be exported overseas. If we want to continue growing our economy and expanding our workforce, we need Charleston Harbor deepened." The new Earthmover tire plant is adjacent to Michelin's existing rubber processing plant in Starr, S.C., and is the third Michelin plant in Anderson County. The company also operates a 2.5 million square foot rubber processing plant, the largest in the world, in Sandy Springs. 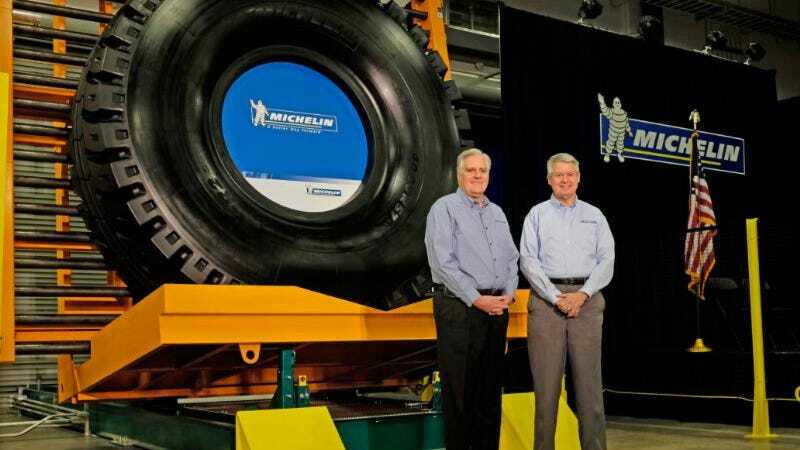 In addition to the Lexington and Anderson County plants, Michelin produces Earthmover tires in Waterville, Canada; Campo Grande, Brazil; Le Puy-en-Velay and Montceau, France; Vitoria, Spain and Zalau, Romania. Dedicated to the improvement of sustainable mobility, Michelin designs, manufactures and sells tires for every type of vehicle, including airplanes, automobiles, bicycles, earthmovers, farm equipment, heavy-duty trucks and motorcycles. The company also publishes travel guides, hotel and restaurant guides, maps and road atlases. Headquartered in Greenville, S.C., Michelin North America (www.michelin-us.com) employs more than 22,000 and operates 19 major manufacturing plants in 16 locations in the U.S., Canada and Mexico.